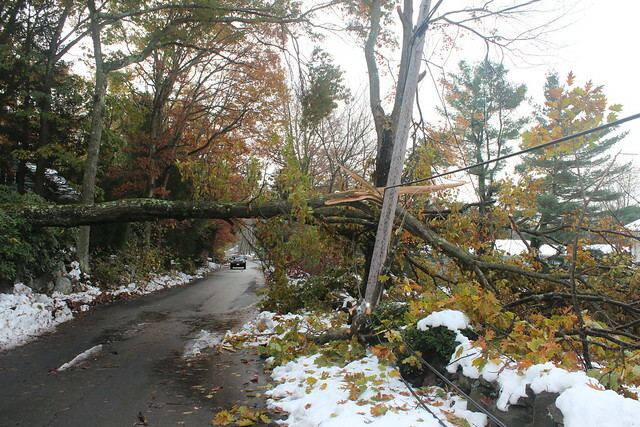 Oh, the tales of unprecedented October snow and power outages in New England! Ours was not so dramatic, but still a bit of an adventure for our family. On October 29th, Saturday afternoon, Adam had his coldest soccer game ever in rain that changed over to snow. I was fortunate to be warm at home with Dova preparing for a dinner party when the flakes started to fall. She wrote this message on our white board for our guests (changing HTML colors is more painful than changing markers, but I couldn't stop once I started). Welcome to the snow kingdom! Where there is tons of snow! You can sled down a snowy hill or make a snowman! There is so much stuff to do in the snow kingdom! There is enough snow for everyone! 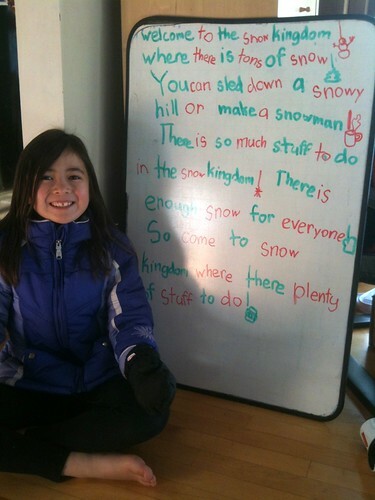 So come to snow kingdom where there plenty of stuff to do! On Saturday evening, we shared stories, good food (ginger butternut squash soup, curry chicken and home brewed beer) and warmth with our friends around the wood stove. When they left, we laughed because they hadn't brought a snow brush for the unheard of October nor'easter. The first sign that something was amiss would have been the drooping trees with branches heavy with snow. Adam immediately donned his snow attire to shake the snow off the trees, but we couldn't find any snow pants or snow boots for Dova. We promised to buy her some the next day. Our friends had to veer around a tree that was hanging low in our driveway to get home. Later that evening, we settled down for some TV and our satellite was not receiving signal due to the heavy snowfall. I climbed out on the deck to clear the snow but it didn't help. We decided to watch an episode of Psych on our DVR, Tuesday the 17th. This episode was a horror movie spoof based in Camp Tikihawa. In one scene, the power had gone out and the villain was going after a victim with a wet mop against a sparking electric panel. As soon as the sparks flew, our own power went out. Wow, spooky! Our lights blipped a few times and came back. But this time, the satellite receiver would not initialize at all and we couldn't finish watching the episode. We all went to sleep with the wood stove keeping the house warm. Adam was first to go out and survey the foot+ amount of snow on Sunday morning. He told us that there was a huge tree down across the end of our driveway. At this point, Doug and I jumped to action to cut up and move the tree, so we weren't trapped in our house. Jumping to action meant that I failed to photograph the full extent of the snow accumulation and damage. My co-workers thankfully came through with these shots from the area. Bench seating for snow only. Low passage. This tree was hung up on the power lines. 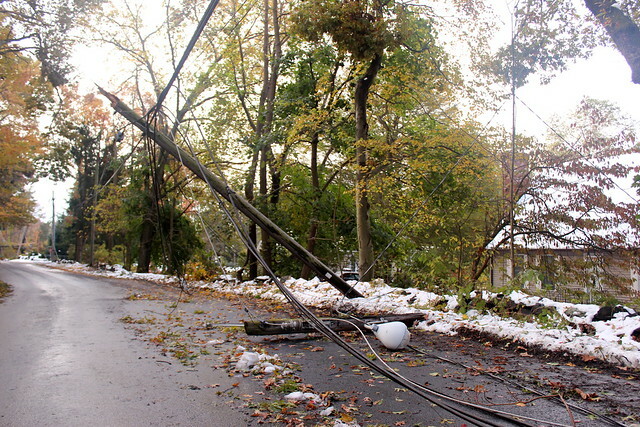 Fallen street lamp and broken power lines. We listened to our Grundig FR200 Emergency Radio for news broadcasts and heard nothing useful at all. I didn't think to look at Twitter on my phone for tweets in my area. I only used my phone to make sparing calls, check email, and listen to our home voice mail. We learned that Halloween in our town was postponed until Saturday, November 5th. I heated (burned) milk on the wood stove for hot chocolate. It came out delicious! We ate cold leftovers for dinner. Mmm, curry chicken. We put our gallon jugs of milk and other perishables in a large cooler on the deck and covered the items with snow. The milk was icy cold and delicious the next day. I yelled, "Don't open the fridge" about four times an hour. I played piano by the light of an LED camp lantern. I couldn't safely put a candle in front of the music. I played Beethoven's Moonlight Sonata (1st and 2nd movements, the 3rd would've cause the lantern to topple). The kids actually played piano for fun because it was entertainment without electricity. We read campfire stories by candle light. We determined that light from a candlestick is much brighter than a column candle or jar candle. The scent from jar candles made me wheezy. I played a long game of Rummy 500 with Adam which he eventually won by setting me back when I was at 490 points. The kids also played Egyptian Ratscrew. Dova's friend slept over because we at least had running water. Wells don't run without electricity. I called into work on Monday morning to learn there was no power. Snow day for all! We found some snow pants for Dova and she wore an old pair of my boots. We didn't venture out until Tuesday. 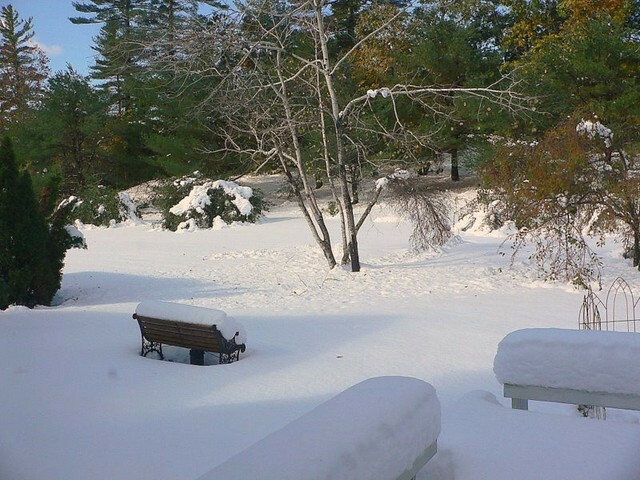 Stores were closed in Nashua NH, so we went near Boston which didn't experience much of Snowtober. I made the kids practice piano and violin while it was still daylight. So much for a snow day break. I cooked ramen noodles on the wood stove. The water took forever to boil, but the kids were glad to have a hot meal. When the power came back late Monday afternoon, I was so thrilled that I kept chanting, "I love electricity!!" Dova thought I was totally crazy for loving such a thing. But after being stressed out in "survival" mode for 1.75 days, it was such a relief to return to normal life again. My work was still closed on Tuesday, and most of my town was still out of power. On Wednesday, our school district had a delayed opening, and the kids went back to school. But that evening, we got a message saying that it was still to dangerous for the buses to maneuver around work crews and broken power lines, so the kids had the rest of the week off from school. Four snow days before the start of winter! I returned to work on Wednesday to find that I was one of the few people that had power. Most of my co-workers were running generators. Every night on my ride home, I would survey the transformers for green or red lights. The main road just behind our street did not have power until Friday. Six days! That could've been us! Thank goodness for electricity at our house. I love electricity! Welcome to the Snow Kingdom! Wow - from jumping in leaves to sledding in a matter of days. OMG--unbelievable! I keep telling myself that we need to get a generator. Sooner rather than later! Courageous adventure! Dova's assay was terrific. Keep up the good spirit and get a generator. Your power outage story from the unexpected snow storm reminds me when I was a little girl lived in a Chinese village, sixty years or more ago. I spent my first eleven-years with oil lamps or a glass oil lamps to light up the dark night. Candles were luxury items, only for the festivals or special occasions. In fact I had no idea and not smart enough to imagine that the radiant light from thunderstorm could be utilized and tamed to light up the dark night, warm up the house and infinite applications for modern society. I thank to Benjamin Franklin and Edison and the other genius to make this wonderful world.